Along the Avenue in some 260 m long segment are remaining some 20 - 25 trees about 30 meters in height, of the species Adansonia grandidieri, endemic to Madagascar. Nearby, in the rice paddies and meadows grom some 20 - 25 more trees of this species. 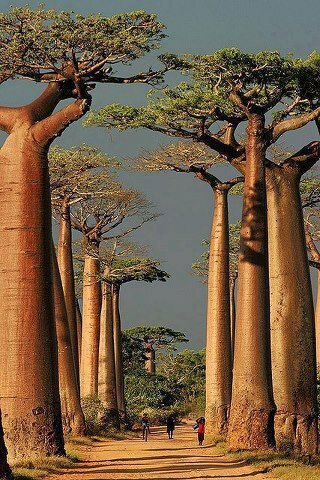 Baobab trees, up to 800 years old, known locally as renala (Malagasy for "mother of the forest"), are a legacy of the dense tropical forests that once thrived on Madagascar. The trees did not originally tower in isolation over the sere landscape of scrub but stood in dense forest. Over the years, as the country's population grew, the forests were cleared for agriculture, leaving only the baobab trees, which the locals preserved as much in respect as for their value as a food source and building material.